Your garage plays an important role in your home life. Whether you are safely storing your vehicle or housing important valuables, the look of your garage matters. After years of use, your garage and garage flooring may even look old and worn down. However, there are few steps you can take to give your garage the appearance of a brand-new space. Old boxes, equipment and decorations can age your garage. Not only do dozens of boxes make for an eyesore, they can also harbor dust, mold and mildew. Don’t forget the potential for unwanted pests. Cleaning your items can clear up these health hazards and let you see what improvements you need to make throughout the garage. Old garage doors prove unsightly. Their cracks, fading paint and loud noises can be bothersome at best. These can also become a safety hazard when your door begins to fail. It is vital to contact garage improvement professionals to install a new door if you really want your space looking brand new from all angles. Years of car and personal use can take a toll on your garage flooring. You can spruce up your space by sweeping and washing off dirt and grass. However, if you want to completely elevate your space, contact garage flooring professionals. These specialists can install tile, epoxy or concrete floors in addition to a fresh coat of paint. Each of these can leave your garage looking brand new. Improved organization can prevent your space from becoming cluttered once. 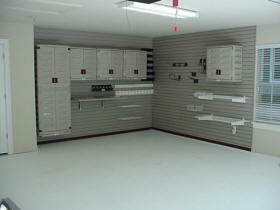 Installing cabinet spaces, lockers, slat wall panels and overhead racks are a few ways to improve your garage storage. These storage solutions can keep larger equipment and items out of your way and make them easier to find. While many of these improvements can be DIY ventures, contacting garage experts gives you a team of knowledgeable professionals that know what it takes to make your garage look its best. Contact a qualified company today to fix garage flooring, install cabinets or add fresh paint to create the garage of your dreams.